Demons and paranormal demonic encounters have been linked together for millennia. Do demons truly exist, or are they just a product of the human mind? 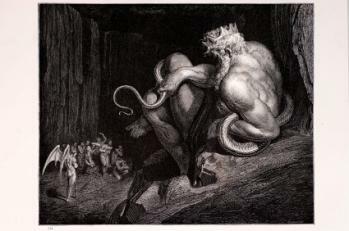 The modern obsession with demons continues to be a source of entertainment and speculation. Movies such as Amityville Horror and The Exorcist are bonafide cult favorites, and a large part of their popularity is due to the fact that these films are said to be based on true events. Who Are the Fallen Angels? The existence of demons and coinciding paranormal activity has been mentioned in historical documents dating back thousands of years. There are multiple references to demons in the Bible, as well as the Qur'an and the Torah. Alongside these references are documentation of supposed cases of demon possession. Still, the subject of demons is a controversial one. While many people believe in their existence or at least the possibility of their existence, others emphatically refute the claim that demons really do exist in the world today. Demons are described in many ways and in many forms, but the one recurring theme through all cultures is that these beings are, in essence, negative forces. Some people follow the tradition that demons are actually fallen angels, the followers of Lucifer. Lucifer was the angel reputed to have led a revolt against God, and as the legend goes, he and the angels who stood with him in this rebellion were cast out of heaven by the Archangel Michael and his army. As these rebellious angles fell to the earth, they were transformed into hideous creatures that became the embodiment of their gross sin. Hence, the descriptions of demons as rotting, unnatural abominations. It's further believed that demons have a mission to corrupt humans. Other people prefer to leave the religious aspects out of the picture. They believe demons are essentially elemental creatures from another plane, although they do seem to agree on their malicious nature. Throughout the annals of history, reports of demonic possession are cited as some of the most convincing evidence of paranormal activity. People supposedly possessed by an evil spirit would sometimes exhibit unnatural strength as well as other phenomena. Reports include speaking in strange tongues, having knowledge the person couldn't have possibly acquired by conventional means, levitating and changes in physical voice and appearance. Opponents of the theory that people can actually be possessed by an unseen malicious entity attribute so-called cases of demonic possession to bouts of mental illness, and deny that there is any connection to the paranormal. It's certainly possible that a percentage of possession reports can be attributed to mental illness, but if reports of some of the associated phenomena are to be believed, there is a paranormal element to some of the stories. Paranormal investigators do sometimes come in contact with negative entities that could be construed as demons. Typical reports of the phenomenon include experiencing a heavy, ominous atmosphere and a sense of foreboding. Many investigators detect a sulfurous, unpleasant odor in the air. Sometimes this is accompanied by an non-human apparition, other times reports of physical attacks are reported. These range from body scratches that appear without apparent cause to hurled objects to body slams that can leave the victim flat on the floor. Whether or not you believe in the reality of demons, most people agree that provoking any form of negative energy is a foolhardy venture. Paranormal investigators wisely warn people who find themselves involved in what may be a demonic encounter to do all that they can to remove themselves from the location. Prolonged encounters, especially ones that involve a confrontation with the entity can lead to a case of attachment where the demon pursues and continues to torment its victim. As yet, there is no definitive proof of demons and paranormal activity. However, if demons actually do exist, does it really matter whether or not people believe in them?